The cooler weather of fall has finally arrived, so lets bring those meats inside and give your grill a break (for a little while at least). 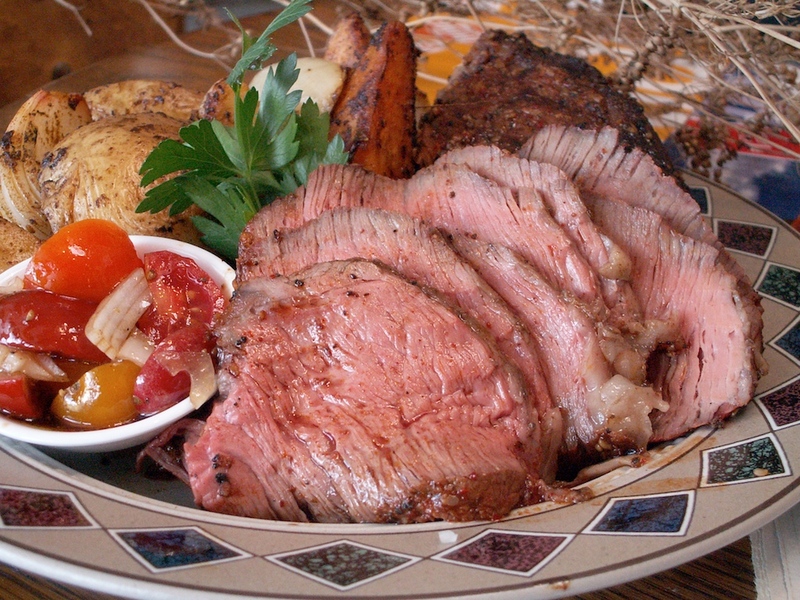 Few dishes are as comforting as a fine beef roast, especially when it’s cooked just right. In this issue, we’re discussing the Dry Oven Method for Roasting Beef – or roasts cooked without liquid. We’ll discuss Braised Pot Roasts and Pork Roasts in a later blog. 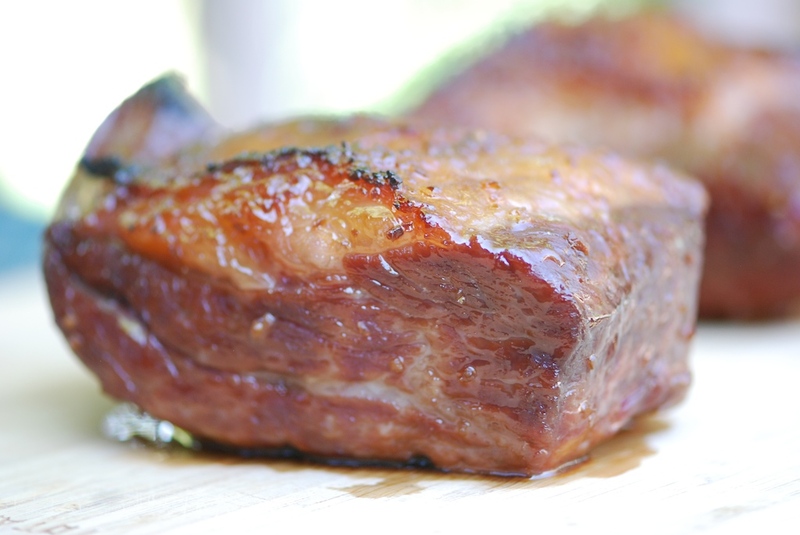 A Tony’s Santa Maria Tri Tip Roast – in a special Jack Daniels, teriyaki and garlic marinade. you want great results), and 2) Don’t overcook it! 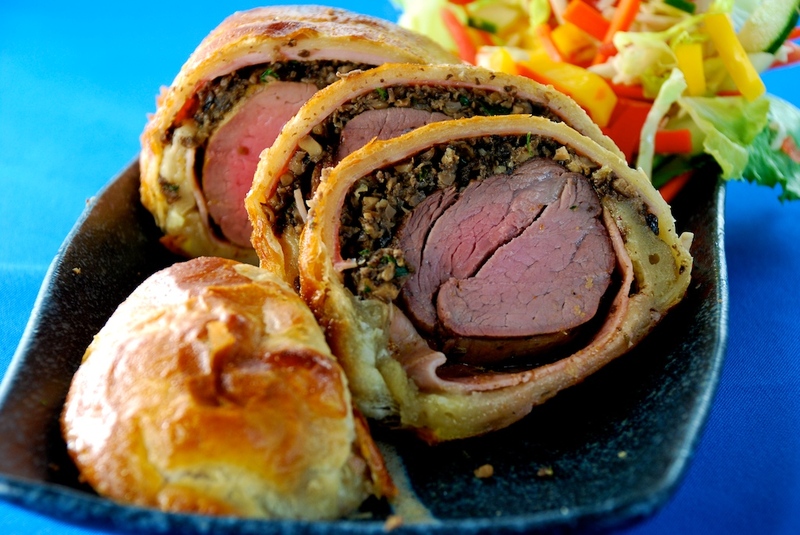 Tony’s Chateaubriand Tenderloin Wellington Roast. 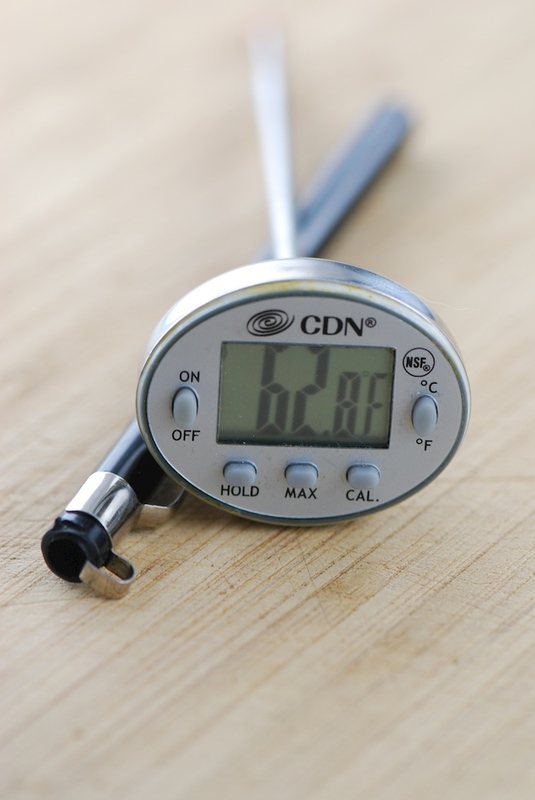 A properly calibrated meat thermometer is an essential tool, and one of the best kitchen investments you can make. For $10-$15 you can get a mechanical ‘quick read’ thermometer, I’ve got one that’s still working after 20 years! You can also get a new digital model for $20-$40 that should never need calibration. Either are great for quickly testing temperatures of roasts, refrigerators, soups, rewarmed foods, etc. Just don’t roast your quick read thermometer in the oven, they have plastic parts that will melt. Test your thermometer’s accuracy by placing the probe tip 1 inch deep into 2-3 inches of rapidly boiling water – it should be 202-203° at Denver metro altitudes (water boils at 212° at sea level, and two degrees lower for every 1,000 feet of altitude). Test ‘old school’ mechanical models before every use, adjusting with the nut under the dial. Most digital thermometers are not adjustable, but I’ve never needed to adjust one, however they do need batteries from time to time. Replace worn out thermometers as needed – it’s cheaper than ruining a roast! Resting is another key to serving a perfect roast. Once removed from the oven, roasts continue to cook, raising about 10 degrees as they rest (the smaller the roast, the more it seems to rise). If you slice while the temperature is still rising, the natural juices purge onto the cutting board. If you rest the roast until it stops cooking, more of the juices remain in the roast. To rest: Transfer roast to a platter or cutting board, cover with foil or parchment and then a clean kitchen towel. Rest roasts for 10-30 minutes (10 minutes for small roasts, up to 30 minutes for a large roast such as a whole prime rib). 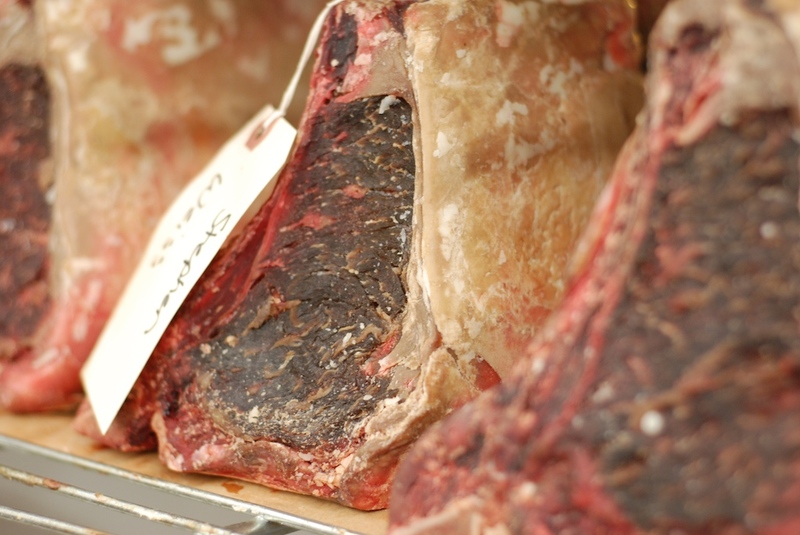 Aging improves tenderness and flavor as it reduces moisture levels – this Tony’s Standing Rib has 3 weeks of age, one week left to go and we’ll custom cut it for this customer. Custom aging and cutting available in all our markets. estimate as conditions can vary greatly! Remove roast from the refrigerator 1.5-2 hours before cooking and rest at cool room temperature. Preheat oven to 325-350° and adjust oven racks to the center of the oven. Place roast on a rack and on a shallow pan and cook in the center of your oven. About 3/4 of the way through estimated time, begin testing internal temperature by inserting the thermometer probe tip into the center of the roast. Avoid any bone or fatty areas and test in more than one spot. Remove from oven at about 115-120 degrees for Rare. 125-140° for Medium Rare to Medium. Cooking to higher temperatures is not recommended. 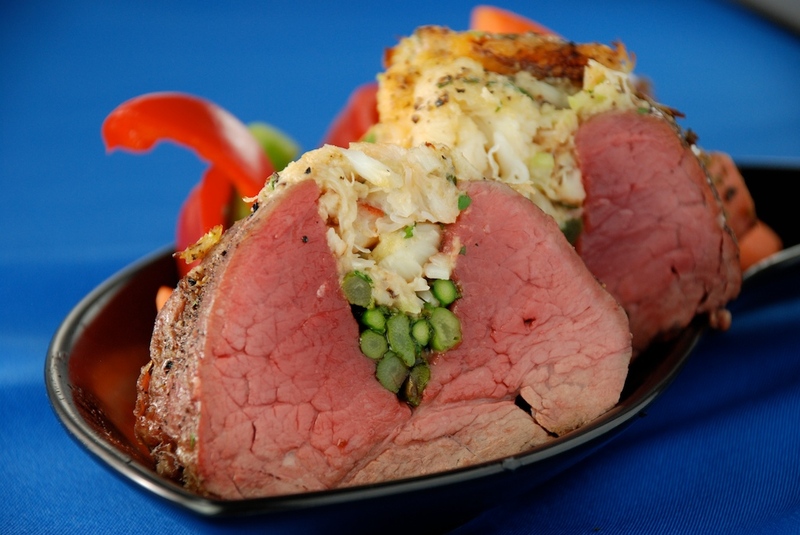 Crab Stuffed Chateaubriand – another holiday favorite from Tony’s Meat Dept. Sprinkle roast generously with one of Tony’s Seasoning Blends, your favorite blend or salt, pepper and herbs. I personally recommend my line of Chef Mick’s Sea Salt Seasonings for roasts: Euro-Crust, Tuscan Grill, Z Blend, Costillas con Chipotle or Chile Arriba! are all excellent. They’re extra chunky to encourage an encrusted finish – available in all our markets. I also like to rub roasts with a ‘Wet Rub’; make one by blending one of the rubs mentioned above with plenty of crushed garlic and olive oil and rub it on generously 1-2 hours before cooking. If your roast is fatted, wet or dry seasonings can be added on top of the larding fat, but I prefer to remove the strings and fat, season generously, and lay the fat back over the roast to baste naturally. Encrusted Tri Tip Roast recipe follows. Great served with roasted veggies, or pasta with Tony’s Marinara or Vodka Sauce. Marinate roast with Balsamic Vinaigrette in a plastic bag for at least 2 and up to 24 hours. Remove from marinade and season generously with Tony’ Euro-Crust or Tuscan Grill Rub. Rest at room temperature as you preheat your oven to 375°. Place roast on a rack in a shallow pan and roast in the top half of a fully preheated oven, cooking to desired internal temperature (125-130° internal suggested). While the roast cooks, cut cherry tomatoes in half. Sliver onions and toss with tomatoes and dressing in a bowl. Garnish with fresh herbs. Remove roast to a plate, cover with parchment or foil and a clean kitchen towel and rest for 10-15 minutes. Transfer roast to a cutting board and with a very sharp knife, slice thinly across the grain. Serve with tomatoes and a loaf of rustic bread.